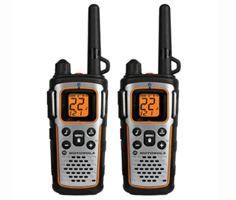 For hunters, tree trimmers, range officers, bikers, and others who need a way to communicate at a distance while remaining protected from dangerous noise such as firearms discharges or chainsaws, we offer a variety of two way headsets that can be connected to a Motorola Talkabout FRS/GMRS two-way radio. While two-way radio headsets can get very expensive, never fear; if you need an inexpensive solution, read on. We have you covered. A low-tech (meaning low priced!) way to create a high noise two-way headset, is to connect a listen only headset such as Howard Leight Sync, or a set of PlugFones to your radio so the inbound comm traffic can only be heard inside the headset where your ears remain fully protected (and the game cannot be spooked by your radio blasting out at the wrong moment.) Then, when you need to transmit, you simply hold the radio to your mouth and transmit as you usually would. Using this approach will insure you always hear your radio, no matter how noisy it gets in your area.